If you’re on the search for a unique birthday party theme, we have a suggestion: Pajamas and Pancakes. It may seem unusual, but it’s is totally genius. No hearing “when does my paaaaarty start?” all day long because this celebration kicks off first thing in the morning! Kick off the excitement by sending out real invitations. 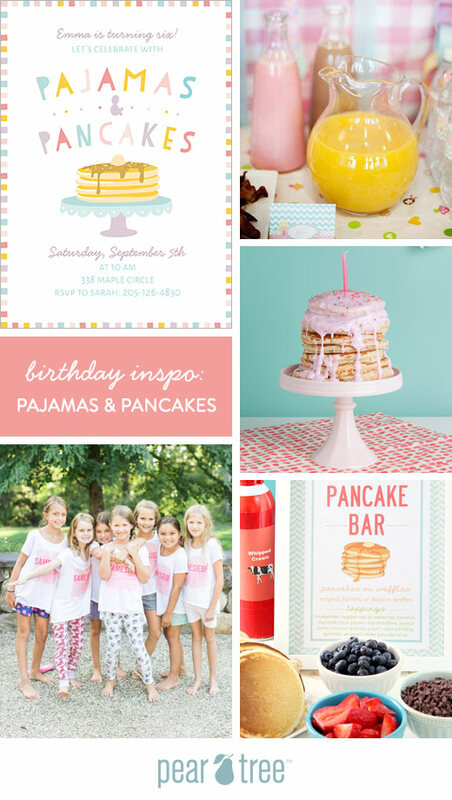 Your kiddo’s friends will be delighted to get a piece of mail addressed to them and this new pancakes and pajamas birthday party invitation will be a great keepsake for you and your child. Simply add your details and have it on your doorstep in days. When it comes to setting the tone for a pajama-themed party, think COZY! Play off of the pastel color palette that’s featured on your invitation to create a space that feels light, bright and warm. Keep it simple with colorful tablecloths and DIY place cards. We love the matching t-shirts featured above. This could also become a fun activity and party favor in one. Purchase white shirts or tank tops, add a few fabric markers and voilà – instant entertainment. A pancake and pajama party is, of course, all about the food! Keep it as simple as you’d like, or go overboard with a pancake bar (personally, we like going overboard)! Our best tip to a stress-free party for mom is to make your pancakes ahead of time then warm them in the oven before serving. Then sit back and let the littles top their pancakes to their heart’s content. Offer the standards like maple syrup and powdered sugar but think outside of the box too. Colorful sprinkles, fresh fruit and even dry cereal make for fun toppings. Maybe, just maybe, throw in some gummi worms or other unexpected treat. It is, after all, a party!